This week's sortie is an old favorite: Lions Head and Signal Hill. We'll head up Signal Hill Road and turn left along the single track path that follows the spine of Signal Hill to the viewpoint at the top. We then retrace our steps, pass the Kramat, and wend our way down through the Noon Day Gun base to pick up the undulating path that runs along the lower western slopes of Lion's Head just above the houses. We'll drip down into the Glen at the end to finish on an uphill. Terrain consists of some slightly rocky single track and some well packed walking paths. The medium group's route measures about 12km. The longer group will add a loop of Lions Head at the beginning of the run making the route up to 13kms or so, but with a little more elevation. Relaxed group to be confirmed on Friday. Park at the Kloof Nek carpark ready to run at 7.30 am. Make sure you read our blog for full safety information. If you stand anywhere in the magnificent city of Cape Town and look up at that mountain we all love so much, look a bit left and you will see a very big pointy rock. This big pointy rock is called Devil's Peak. There are several reasons why it is called Devil's Peak - here are 2 of them. If you are out at sea, from a certain angle, Devil's Peak has 3 points - a central taller point and 2 lower points on either side - something like the Devil's spear. What rubbish. There was a formidable Dutch pirate called Jan van Hunks who retired with his plundered wealth and lived on the lower slopes of the mountain with his wife. He loved to smoke his pipe which his wife did not enjoy at all, so he would walk up to the saddle between Table Mountain and Devil's Peak and sit and smoke his pipe there. One day on the saddle he came across a man dressed in black who also liked to smoke pipe, and they fell into a wager about who could smoke the most. The man in black turned out to be the devil, who won the competition after several days and much smoke, and so took Jan van Hunks soul. Jan was never seen again. Now when you look up at that saddle between Table Mountain and Devils Peak and you see that first wisp of cloud coming over the saddle which eventually turns into a full on tablecloth that lasts for several days, know that Jan van Hunks is back up there trying in vain to get his soul back. Don't mess with the devil, it seems. But back to Table Mountain Trailers. On Saturday we are going to circumnavigate that big pointy rock and pass the spot where Jan van Hunks lost his soul. We start at Newlands parking at 07:30 (where the helicopters are), turn right and go UP. UP the jeep tracks and left onto a single track which takes us UP to the turnstile. Then we go UP to the King's Blockhouse (more history). From the blockhouse we go UP Mowbray Ridge (mild exposure and rock scrambling), then UP some more to the abandoned fire lookout. 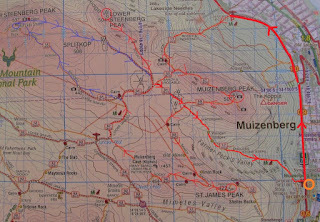 (If it is raining we might give Mowbray Ridge a miss and turn right along the contour and up to Oppelskop). Then we go UP a little bit more to a T-junction where we turn right. This is a beautiful scenic route that brings us to the Devil's Peak path which takes us down to Jan van Hunk's site of demise, and then we go down Newlands Ravine (also stunning) back to the cars. There will be a car guard, please bring him something. This route is only about 10km, but be warned, it is a reasonably tough 10km which will take a bit more than 3 hours. The weather people - at this stage - are calling some possible drizzle but not much wind, so bring something warm and waterproof, plus all your normal safety gear, water, whistle, munchies, etc. We will start off as one running group. If a faster group forms on the first jeep track uphill, we can split into two group depending on someone knowing the route. Please phone / email / whatsapp if any questions. This week sees us heading up the Steenberg Plateau Path to Muizenberg Peak taking a loop through Silvermine and descending Pecks Valley. Starting at the “Toad on the road” corner M4 (main road Lakeside) and Boyes drive, continue along Boyes Drive, Passing the turnoff down to old Boyes drive, Over a hill, just a few meters up the next hill, notice a blue gum stand on your left and a stone wall on your right. There is an opening in this wall, hence the name. Park on the pavement of the road. From the Hole in The Wall along Boyes Drive Over a steep hill, past old Boyes Drive and on till a path leads up just before Lakeside Pinnacle. 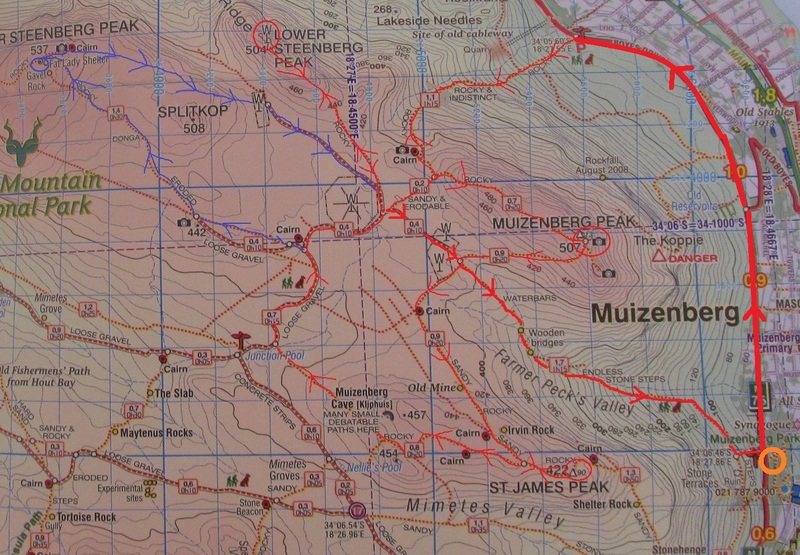 At the Steenberg Plateau path (marked by TMNP signboard) we head on up the mountain. As Steenberg Plateau comes into view, take the path to the left heading up to Muizenberg Peak. From Muizenberg Peak continue down to the top of Peck’s Valley and at the 4 way junction we keep straight, staying on the plateau. At the next junction, where the path ahead becomes indistinct with a more obvious sandy path to the left, turn left. This route takes us past the old silver mine (see the wire fence) to which the area owes its name. Past the mine the path leads us up, into the rocks. At the next junction continue straight on, to St James peak. From St James’ summit, we back track and at the fork take the left hand path, heading towards Muizenberg Cave. From the cave we head down the valley with Steenberg Plateau on our right. Upon meeting the jeep track, take a right turn to follow it and continue on until reaching the turnoff to Higher Steenberg Peak, marked by a handy metal plaque. Here the Fast Group will head out to the Fat Lady’s Cave / Higher Steenberg Peak. At the junction where you see erosion fencing behind you, take the right hand fork (red gravel path) leading directly to Fat Lady’s Cave. Just past the cave, take the right hand path towards the large cairn which marks the viewpoint. At this cairn there is a small unmarked path leading down the ridge line to your right. Follow this path, it leads back to Steenberg Plateau providing lovely running and some great views of Cape Town to your left. This path end amongst some rocks behind one of the fenced off navy communication structures. Go around the fence to meet a Jeep track and turn right there. From the point where we leave the Fast Group, the Medium Group will continue straight along the Jeep Track, passing around the fenced off Navy Communication Tower. The Slower Group will follow a similar route up to Muizenberg Peak. The leader will decide the route forwards from there on the day. Unfortunately the beautiful rain we've been having also means trickier running conditions so it seems best to move this weeks route to a more runnable area, although we should still be treated to wonderful waterfalls and streams. From the Constantia neck parking we take the first shortcut left up to the next level jeep track. Following the jeep track up a little more we then take the sandy path right, down to join the scenic contour path above Cecilia and Kirstenbosch towards Nursery ravine, Skeleton Gorge and to the foot of Window Gorge. Turn and run back to the "Fourways" intersection above Kirstenbosch dam and from there the lower route through Cecilia forest back to Constantia neck. RV in the Constantia neck parking area ready to start at 07:30. A mix of jeep track, mountain trail and single track, not too technical. Distance: ±12-14 kms taking about 2h30 mins. A whistle, water, a warm & waterproof top (looks like more rain to come), space blanket and ICE tag or card. We arrived in the parking area in the dark just before 7.30, barely able to see through the downpour of rain! The turnout was pretty good considering the weather! Fortunately the rain lifted as we began our run and pretty much held off until the last 1 or 2 km of the medium group. We warmed up in no time as we made our way up to Rhodes Memorial and then across and up towards the Kings Block House via heartbreak hill. The two groups went their separate ways after we reached the turnstiles as the faster group wanted to aim for a run of approximately 20km. The medium group followed the single track heading towards Contantia Neck, the silence in the forest was regularly interrupted by the strong flowing rivers and waterfalls that we crossed, a beautiful sight to see. We were grateful to have made it along the many slippery boardwalks, but not without a few breakdance moves and tree hugging. At the big rock we turned left downhill towards the lower contour and back towards the start. Thanks to Geoff for taking us off the beaten track where we had to hurdle giant tree trunks in order to find the path again; it would not be a trail run without a bit of extra adventure! We covered over 12km and made it back to the parking lot just before 10am.